The first time I did cake pops was 2 years ago. 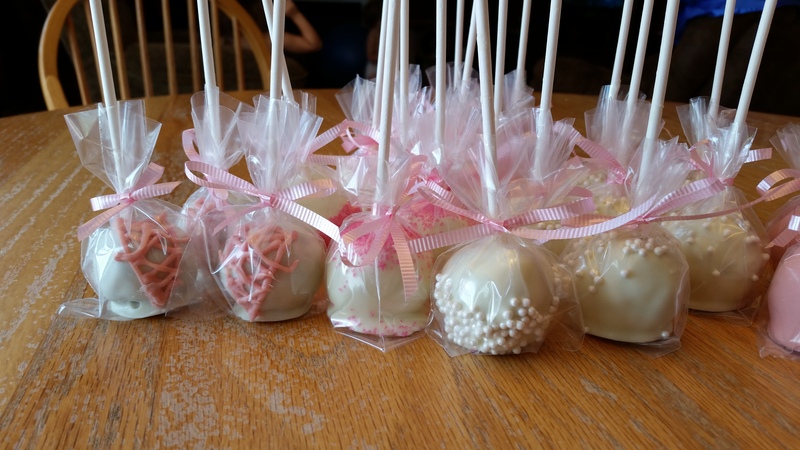 I offered to make the cake for my second cousin’s 2nd birthday, and my cousin said that she really wanted cake pops. I didn’t even know what cake pops were, but I had enough time before the party to do research and practice and I thought I could manage it. I mean, how hard could dipping a ball of cake on a stick in chocolate be? Turns out it is very hard. Good thing I had time to practice before making the real ones for the party because I was WAY in over my head with those innocent looking monsters. My first mistake was trying to color the chocolate myself; it seized up on me. Then I found out that you have to use an oil based food dye to color chocolate or else it…seizes up. I had pops that were falling off of the sticks when I was dipping them, cups of pops falling over while the chocolate was still drying, chocolate dripping EVERYWHERE, and time tick-tick-ticking away. 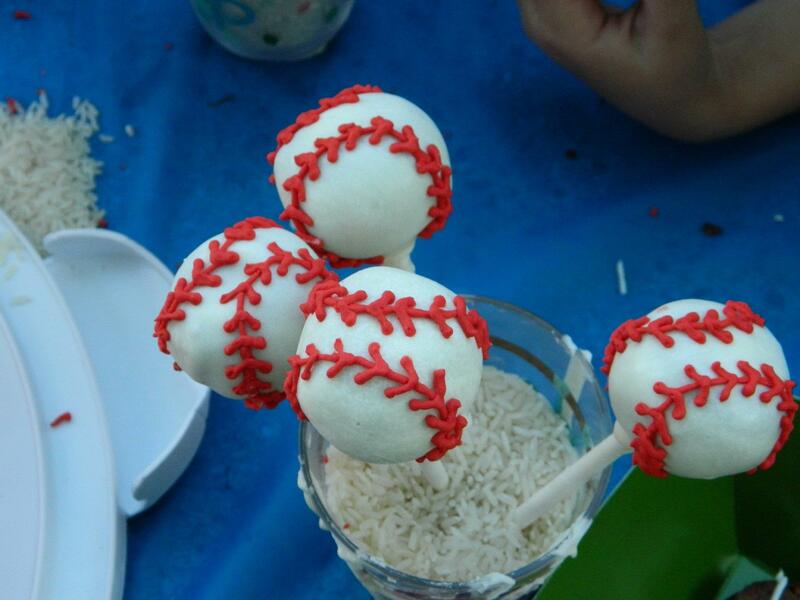 Originally, I was supposed to do 3 different kinds of cake pops: baseballs, basketballs, and footballs. My cousin called me the week of and said that one of her friends could make football brownies, so that took one off of my list. Then a few days later I ended up calling her asking if I could just do baseballs because I didn’t know that I needed a special dye to make the chocolate orange and I didn’t have time to go buy candy melts and try to fuss with those as well. She really wanted basketballs too, so we compromised on a basketball cake and baseball cake pops. In the end, I pulled it off but only by the hair on my chin. I was piping up until 20 minutes before we had to leave. But the kids LOVED the cake and especially the cake pops, and my cousin was so grateful that it made it all worthwhile. Despite all the stress these things caused me, I was happy with the result. But I was not overly anxious to try my hand at them any time soon either. 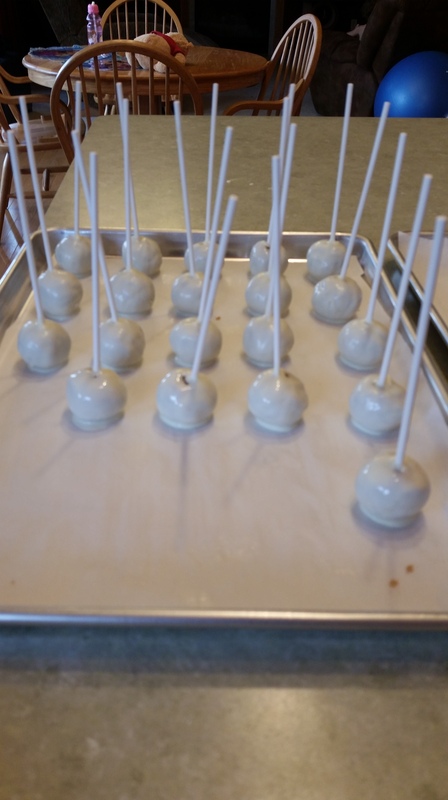 The next time I tried to make cake pops, it was to save the cake for my 25th birthday. The cake stuck to the pan and crumbled coming out into a huge mess of chocolate on the counter. With guests set to arrive within 2 hours, my initial reaction was to chuck it on the street and run it over with my car out of rage, but then one of my friends suggested turning them into cake pops. 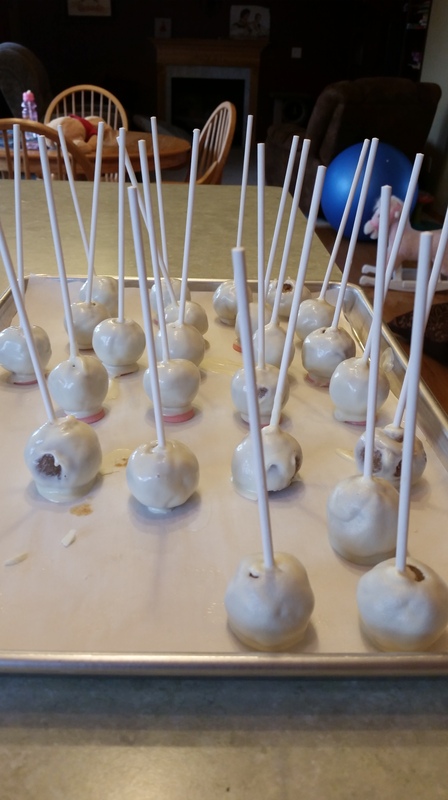 Or cake balls, as it turned out, since I didn’t have any sticks. All I had on hand was dark chocolate chips, and they didn’t really melt well so it went on thick. They were very rich, but still good. I refused to take a picture of them because they were hideous. The next time after that, I was just trying to make use out of extra cake bits that I had shaved off while sculpting a large cake. I added too much frosting, and had to chuck them. Unfortunately I stubbornly tried this with the first half of the whole batch before giving up on it. It didn’t look quite as bad after it got dipped 2 more times. 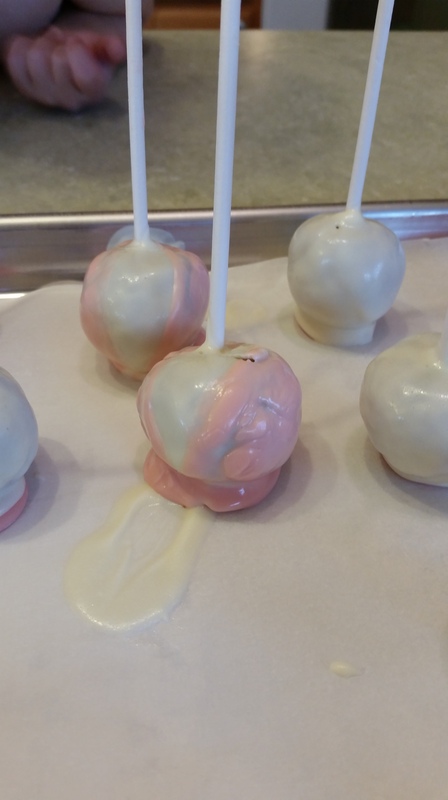 However, I didn’t prep the pops the way she recommends in the blog post by flattening the bottoms beforehand, because I have this bad habit of skimming and looking at pictures. Perhaps this time I will learn my lesson (but probably not). The real problem began when I tried to dip them a second time for the pink coat. The white chocolate from the pops were melting into the pink chocolate in the bowl, and the pink that got onto the pops crackled and looked like a turtle shell. 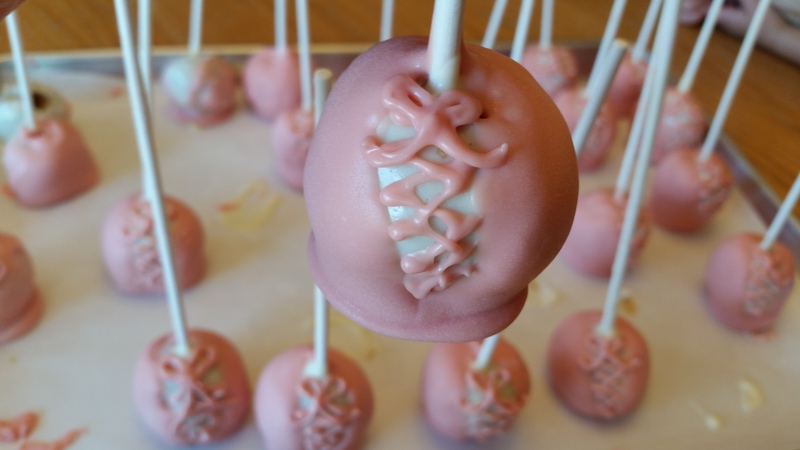 I did everything she said, and found this YouTube video on how to make these ballerina cake pops (which I am still kicking myself for not finding earlier, so that I could have actually done it properly), and finally got the results I was hoping for! Mind you, they are not perfect, but I am still really proud of how they turned out. I threw the melted candy in a piping bag to do the laces and bow, but only had enough of the pink stuff to do half of the batch. The rest got a second dip in white chocolate and some pink sprinkles and pearls. Then I wrapped them all individually with treat bags that I found at Hobby Lobby (a pack of 50 for $2) and a pink ribbon tied in a bow and called it a day. 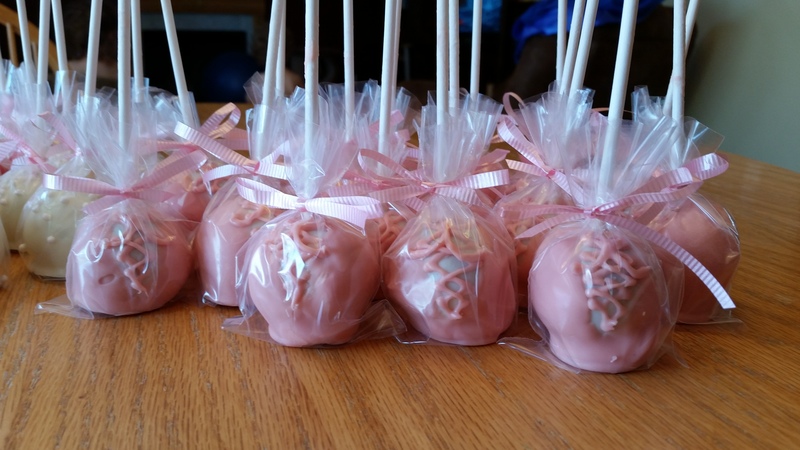 All of the girls in Eowyn’s dance class loved their ballerina cake pops, and there were plenty left over, so I left the rest with the dance teacher for one of her other classes. In the car after her class, Eowyn said, “Thanks Mom for making my dance class so special! You’re the best!” Which of course, made it all worth it. DO RESEARCH FIRST! There are so many tutorials out there for different techniques that I don’t take advantage of. I see something on Pinterest and think, “I can do that!”, get overly excited and jump into it without trying to learn how to do it first. I would have saved myself so much time and energy if I had found that video before I was knee deep in burned pink chocolate. Buy a candy thermometer. Seriously could have saved myself $6 had I not burned the first two batches of candy melts. Add more frosting to the cake next time. It’s such a fine balance between too much and too little frosting with these things. But a handful of the sticks came out while I was dipping the pops, so I think the cake “mix” needed more frosting to bind it all together. If at first you don’t succeed, try, try again. 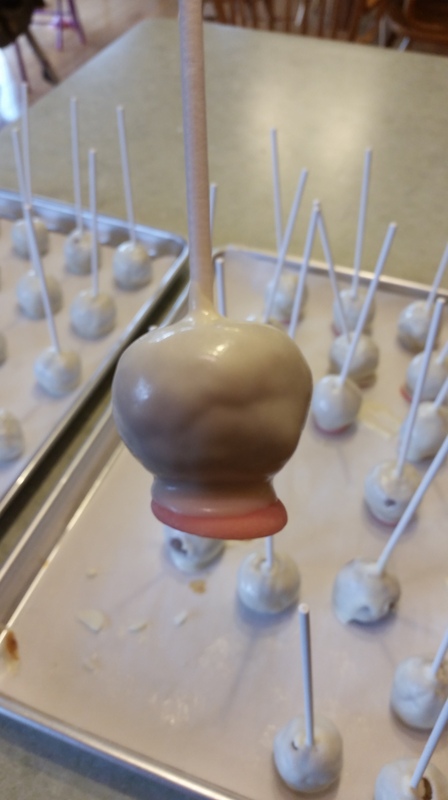 The only way that I will ever get better at cake pops is if I keep trying to make them. I can’t let myself get so frustrated that I never try again. At the end of the day, I pulled it off. But I will keep working on perfecting the art of chocolate, because I want to be able to make beautiful things. Cheers to future baking adventures!